If you have just started a business or even if you've been in business for a while. It’s just like a hit kind of a low patch you may not have the funds necessary to actually invest in your business right now. 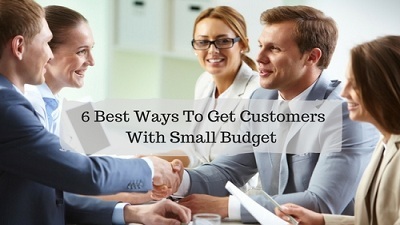 That's why this article is going to be very important for you because with this 6 ways you can start to attract new customers right away even with a really tiny budget. So, let’s get started. There's no better referral than from someone who has already hired you and is satisfied with the work that you provided for them. So, call your previous satisfied customers between 15 and 20 of and ask them for a referral. You can tell them about your new offering that you've implemented for this year and it may even be a good fit for your previous clients as well. When you ask your previous clients, hearing your new offers, they may even decide to rehire you depending on where they are in their business or they may know someone who's just like and fits your ideal profile of your clients and they'd be happy to give you a referral. Read the 10 ways to make your customer return to your business which will help you to retain your old customers as well. Reach out to your friends, your colleagues, your former co-workers and other business associates and let them know what you're working. Tell them about your recent successful project that you had and what types of clients are a good referral for you or you can even offer a bonus for any referral they give to you. Like, if someone refers to you and that person ends up becoming a paid client of yours. You could give that referral some kind of incentive. It can be monetary or non-monetary but it's a good way to encourage people to go ahead and act as a referral source for you. We cannot deny the power of social media but when choosing social media advertising, we have to be strategic about it. So, when you set up social media advertising, you have to make sure that your social media Ads are targeting the right audience. When selecting social media Ads you have to target the right audience geographically, demographically and psychographically and it’s really great about Facebook Ads in particular. Read the 7 common mistakes in social media strategy every marketer tends to make. Facebook Ads lets you actually target people based on what your interests are. You also have to make sure that you have a good call to action when you're running an ad on social media especially if you're running it to kind of a cold audience who doesn't know you yet. It's not a good idea to say; ‘Hey here's who I am by all my stuff’. You have to ease them into it so that you could run an Ad for a complimentary consultation. When you target in this way, you will have a chance to know, have a conversation with you and then you can explain to them how you're a good fit or how you can solve their unique problem. You can create a two-hour workshop on a topic that is relevant to a problem need want or desire that your ideal client is currently dealing with and the purpose of your workshop should provide some value and showcase your expertise. What you can do is secure room at a local community center, at some local business incubator or co-working space or even at your local library. All of those places usually will let you rent a space for either free or very little money and you can host a two-hour workshop there. A lot of those places will actually help you to market the event either by putting a flyer out or sending out an email notice to their email database. If you can get let's say 10 to 20 people in the room and convert even one to two people to become your clients then you come out ahead and you could even charge a small fee between twenty and thirty dollars for people to attend the workshop so that it covers the cost of the space and any light snacks that you might provide for the workshop. I have you to think about what other small business owners offer a complimentary offering and find out who else is selling something that's a good match for what it is you're selling and how you can partner together. For example; if you are a wedding planner you might partner with a dressmaker or if you are a caterer who provides the savory offerings you may partner with a baker who provides pastries cakes and desserts or if you are an accountant you might partner with a lawyer because people who are in business always need both. What you can do is, you can either set up a referral system. Where if someone hires you then you can also refer them to that person. You can even set up a subcontractor arrange where you work for a bigger company to provide a service that they can't provide but that their clients will benefit. So, find someone who you can partner here really think outside the box and determine who you can partner with and reach out to them. Much like the in-person workshop, your goal is to share some valuable content with your ideal audience. You don't need a thousand people to sign up for your webinar. If you can get even 20 to 30 people online you can convert a couple of those people who listen to your workshop you’re your clients. There's a lot of webinar software out there that you can either use for free or they have a free trial so that you don't have to pay any money before you get your workshop off the ground. Comment below if you need additional assistance with any of these ideas or if you're interested in some additional ways that you can market your business. 7 Best low-cost marketing strategies for your small business.